How Many Solar Shingles Do You Need? The average roofing installation price for a solar shingle roof costs anywhere between $60,000 to $75,000 depending on the slope, pitch, and size of your roof. You can expect to pay $21 to $25 per sq. foot or $2100 to $2500 per square installed on a standard sized single story home. Costs will vary depending on local solar roof contractor’s pricing. View your potential roof installation savings with contractors serving your area below. It’s always smart to get price quotes from at least four local pre screened and licensed solar shingle roof installers before starting your project in order to get the best price in your area on your solar roofing installation. 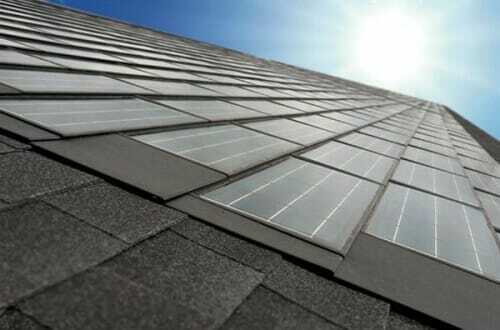 Solar shingles are a relatively new technology designed to look like ordinary asphalt shingles. They protect your roof and have the same durability and flexibility as regular shingles, while harnessing the sun’s solar energy to generate power for your home. Each solar shingle will produce between 13 and 63 watts of energy, depending on the brand of solar roof shingles. Solar shingles are lightweight and easy to install and just like ordinary shingles, they are designed to withstand rain, wind, and hail. The number of BIPV shingles it would take to power your entire home depends upon the size of your house and your typical energy usage, but even installing a few can help out. It is not necessary to replace your entire roof as you can integrate solar shingles into your existing roof. If your roof is in need of an overhaul anyway though, replacing your roof is not a bed investment. According to the most recent Cost vs. Value report, replacing the roof on your home can have an an ROI of 71.6%. Additionally, recent Department of Energy backed studies have demonstrated that homebuyers are willing to pay a premium for homes with solar roofing features–up to $15,000. More aesthetically pleasing than bulky solar panels. Solar shingles are able to be removed and taken with you if you were to move to a new home. Can be less energy efficient than solar panels depending on the solar install project. Needs a particular roof slope where sun is readily available in order to get the most value out of it. Life span of solar shingles may not be as long lasting as solar panels. Many solar installers do not offer solar shingle installations as an option. Solar panels (dependent on the job type) can often be more efficient per watt relative to the cost of installation. Solar panels are more efficient, so you don’t need to use as much roof space to bring down your electric bill. Solar shingles also may not last as long. They haven’t been on the market long enough to provide any true indicators of their potential for longevity. Additionally, very few solar installers use solar shingles so it can be difficult to find an installer who can complete your solar shingle roofing installation.